Finally, the iLIFE V7s Series, also known as Chuwi V7s is here and we just have to review it to see whether it fits the much hype it had. 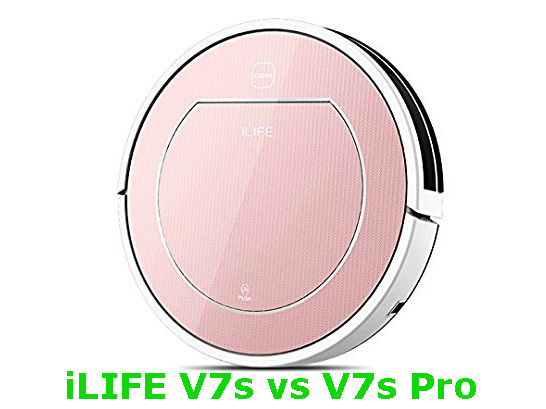 The iLIFE V7s series, just like the previous V Series robotic vacuum cleaners has two variations, the iLIFE V7s vs iLIFE V7s Pro. Being the latest series from iLIFE, we expect to see a whole lot of new and sophisticated features. To get the best picture of what the V7s Series offers, we had to get an experience of what they offer in order to write a more clear and accurate review. The V7s Series owes much of its design to the predecessor, the iLIFE V5s Series. Much of the features like i-Dropping Technology, 2-in-1 Cleaning, RoadRover wheels and several other are still intact. So, this begs the question, why is it superior? The V7s Series brings on board several new unique and sophisticated features. First, it comes with dust bin detection that alerts homeowners whenever the bin is not inserted properly or is absent. Second, it has a larger 0.45-liter water tank that reduces the frequency of filling while the 0.5-liter tank reduces the frequency of emptying. The robot cleaning has also been enhanced to offer smarter hybrid vacuuming and mopping courtesy of the upgraded software. Just like the previous models in the iLIFE V Series, we are going to discuss the features of the two vacs in depth. We are going to see why the V7 Series is poised to be the game-changer by discussing its features. We are going to look at both the base features available in the V7s as well as the extras that the V7s Pro comes with. Without further ado, here is the review of the iLIFE V7s Series. iLIFE V7s vs iLIFE V7s Pro – Which One is Best? Is the iLIFE V7s and V7s Pro Worth My Money? Different homes have different floor types and different cleaners are suited for different floors. Fortunately, the iLIFE V7s Series has been engineered to suit a majority of floors. We tested this cleaner on hardwood, tiled and ceramic floors are the results were unquestionable. Another major factor here is whether it was able to clean thin carpet and most importantly, whether it was able to cross from floors to carpets, something it excellently did. So when it comes to floor priority, we rate the V7s Series among the best! Another major factor to consider when shopping for vacuum cleaners is the design. A good vac should have a low-profile design to ensure maneuverability. This is exactly what the V7s Series offers. Even though its height is slightly higher than the V5s Series, it still has better maneuverability under chair legs, beds, furniture, kickstands and so on. The V7s is also swift and navigates under furniture seamlessly. The 3.15 inches height fits under many household fittings. As far as maneuverability under obstacles and deeps corners is concerned, we found the V7s to be great. When you hear of love at first sight, then the V7s is worth mentioning. As we were opening the package, we expected the normal design that iLIFE is used to but we were surprised. What we saw confirmed that iLIFE took its time to deliver not only a high-performance cleaner but a high-performance vacuum cleaner that is appealing to the eye. The V7s sports a very unique and attractive design that I’ve never seen with these other popular vacuum cleaners. It has an aesthetic design and cool finish that makes it stand out among the rest. It is available in several colors; rose gold, gold, gray, silver and white. The iLIFE V7s, just like its predecessor, the V5s, gives you the power to do more. Unlike many other of its competitors that only offers vacuuming and brushing, the V7s offers 2-in-1 cleaning. It is capable of both vacuuming and mopping thus cushioning you from the need of buying another machine for mopping. This vacuum cleaner has been built to offer both wet and dry mopping. It comes with a 77.5 sq-in microfiber cloth mops surfaces very efficiently using minimal water. During our tests, we saw that the water tank only dropped water when the unit is in motion. Whenever it stopped, no water dropped. This technology also prevents excess water from reaching the electrical components of the vacuum cleaner which can be disastrous to the vacuum cleaner. I-Dropping Technology is available in the Pro Series. Please note this exclusion so that you don’t end up buying the V7s thinking it has i-Dropping technology. If you read many online reviews and forums, you might have come across customers complaining of damaged components because the vacuum suctioned debris without the dirt bin in place. The suctioned debris destroy internal components and worse enough, may render the cleaner useless. With this in mind, iLIFE incorporated a new technology; Smart Dustbin Detection. This technology alerts homeowners in the event the dirt bin is not inserted or when it is inserted wrongly. This prevents it from sucking debris into inner components which are hazardous. However, it is important to note that this feature is only in the V7s Pro and is among the features that make the V7s Pro superior to the V7s. This vacuum cleaner comes with a set of smart sensors to enable it to navigate around your house as well as keeping it safe. It comes with very reliable anti-drop and anti-collision sensors for its safety. Anti-drop prevents it from falling off the stairs while anti-collision helps it avoid hitting obstacles. iLIFE crafted the V7s with larger water and dirt tanks. A fascinating thing about this is that the increment never compromised on its low-profile design. It’s still as compact as the V3 Series and the V5 Series with this new addition. First, it has a 0.5-liter water tank. This tank holds more water compared to what’s found in the V5s which holds 0.3-liters. Second, the dirt bin size is also impressive. It can accommodate up to 0.45-liters which is enough to clean an averagely dirty room thrice without being emptied. The V7s is one versatile vacuum cleaner. It allows homeowners to customize their cleaning preference courtesy of the four cleaning modes available. This cleaner comes with Auto, Edge, Spot and Schedule Cleaning modes. Auto mode sends the cleaner to execute a normal cleaning. On the other hand, Edge cleaning comes in handy when you want to clean the most ignored parts of your house; edges, walls, and deep corners. Spot cleaning is for cleaning stained areas and other parts with more dirt while Schedule cleaning is just like it sounds, programmed cleaning. The V7s is a robotic vacuum cleaner. Therefore, it should be able to work with minimal human interference. One big issue here is that it should be able to manage its power independently, and that’s exactly what it does. As usual with most robotic vacuum cleaners, the V7s comes with self-charging and auto-resume capabilities. This technology enables the cleaner to detect whenever its battery level is critical. It then transmits this information to its new operating system which prompts the cleaner to locate and go to its charging base for battery recharge. This intelligent vacuum cleaner will go back and resume from wherever it left. This makes it such a great reliable and efficient home assistant. One thing we liked about iLIFE is that it has equipped most of its robots with physical remotes, the V7s is no exception. This is a major boost considering the fact that many top cleaners from popular brands have no remote control. Other are compatible with remotes but are not supplied in the package means you have to purchase them separately. The V7s comes with a remote control that has a simple LCD to help you monitor whatever settings are running currently. On the remote, you can access all controls easily. Please note that the V7s comes with a remote control so you don’t need to purchase it separately as is in other vacuum cleaners. You can control this cleaner from a distance of around 13 feet. Personally, I have known iLIFE for its efforts in manufacturing long-lasting batteries that notably last for longer than those in many of its competitor’s vacuum cleaners. In the V7s, this trend has been duplicated. The iLIFE V7s boasts a 2600 mAh Lithium-Ion battery that has been optimized to offer unrivaled efficiency. Compared to other models, it offers more cleaning time and doesn’t fade easily even after many charging times. It is important to note that a good battery, on a single charge, should last for more hours to reduce the number of charges in its life cycle. This is because the more you charge a battery, the more it fades. We tried out this battery in different cleaning modes and the results were impressive. The V7s lasted for about 110-120 minutes while the V7s Pro delivered an impressive 120-140 minutes on average. This battery charges for an average of 300 minutes. That is a whole six hours. We find this to be quite long, but it is uniform in all vacuum cleaners. For that reason, we think the entire field of robotic vacuum cleaners should work to ensure shorter charging times. The difference that set the V7s and the V7s Pro apart is clear. But for the record, we are going to summarize them. (a) i-Dropping Technology – The V7s Pro comes with i-Dropping Technology, something the V7s lacks. (b) Smart Bin-Detection – The V7s Pro also has dustbin detection technology which is not available for the V7s. (c) Battery Life – In terms of battery life, the V7s Pro is also superior. The V7s Pro can average 120-140 minutes while the V7s can average 110-120 minutes. (d) Wheels – The V7s Pro has larger wheels compared to the V7s. Definitely, I would choose the V7s Pro over the V7s. This is because the V7s is bigger in terms of features as well as performance. 1. Sleek Design – This is perhaps the best thing about the V7s. Its sleek and stylish design is comparable to none. 2. Extra Filter and Side brush – As usual, iLIFE included a free extra side brush and HEPA filter to cushion you from the first replacement costs. 3. Larger Tanks – Another great thing we liked about the iLIFE V7s is the larger dirt and water tanks. It comes with a 0.45 liter and 0.5-liter dirt and water tank respectively. 4. Low-Noise Operation – This vacuum cleaner emits less than 60 dB. You can relax or even sleep when it is working without any disturbance. 1. Lacks Wi-Fi – In our opinion, this has been a big let down for iLIFE vacuum cleaners. Even though the V7s may be the crème de la crème of iLIFE, it faces huge competition from the likes of Roomba and ECOVAS that come with Wi-Fi. 2. Disregards Black Rugs – Initially, we thought that there was a bug when it disregarded a black carpet rug. However, on a few more trials, we realized that it doesn’t go over black carpet rugs. However, on trying a different carpet rug of different color, it worked perfectly fine. 3. Troubled Navigation – Like earlier mentioned in our other reviews of iLIFE V Series, the V7s still has some challenges with its navigation. The V7s Series enjoys monopoly when it comes to iLIFE’s top vacuum cleaners. However, when it comes to the entire market of vacuum cleaners, it faces stiff competition. One thing that is such a letdown, and importantly, where it faces competition is in terms of connectivity. By now, almost all robotic vacuum cleaners have Wi-Fi technology. This is one major area that the iLIFE V7s is deficient. Unfortunately, it is where we will base our argument on its competition. The V7s Series faces stiff competition from the likes of the Roomba 650 , bObsweep bObi Pet, among others. If iLIFE had built it with Wi-Fi and an elaborate navigation system, it would be a great vacuum cleaner. Being the latest models from iLIFE, a renowned manufacturer of top notch vacuum cleaners, the iLIFE V7s Series shouldn’t go unnoticed. The fact that they can vacuum and mop puts them a great step ahead of most of their competitors. Even though they lack Wi-Fi, the iLIFE V7s is still a worthy set of vacuum cleaners that every enthusiast should drool for, at least have them in your wish list. From the fact that they can vacuum and mop effectively, the V7s and V7s Pro remain a favorite for most homeowners.